DVD/CD receiver with internal amp (14 watts RMS CEA-2006/50 peak x 4 channels). Motorized 7 touchscreen display with NEX user interface. Built-in Bluetooth for hands-free calling and audio streaming; supports two phones at once. Siri Eyes Free with compatible iPhones. Multi-color illumination with MIXTRAX audio and visual effects. For single-DIN (2 tall) openings. Built-in iPod, iPhone, and iPad control optional adapter required for viewing video content (see Details tab for info). Playback and control of music files on compatible Android devices. AppRadio One compatible with select iPhone and Android devices. Pandora and Spotify control with iPhone and Android. Plays audio/video content from CDs, DVDs, and USB memory devices (see Details tab for full capabilities). FLAC file playback via USB. 13-band graphic equalizer with 7 preset EQ curves. 3-way network mode (sets preamp outputs to highs, mids, lows). Auto-EQ equalizes for your car interior automatically. Inputs: rear aux in (minijack); rear A/V in (RCA); rear USB, rear-view camera input. Outputs: video output, 6-channel preamp outputs (4-volt front, rear, subwoofer). Compatible with optional AVIC-U260 navigation module. 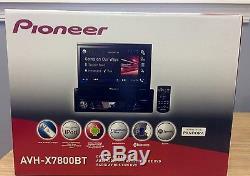 The item "Pioneer AVHX7800BT Single DIN Bluetooth In-Dash DVD/CD/ Car Stereo 7 Flip-Out" is in sale since Tuesday, August 09, 2016. This item is in the category "Consumer Electronics\Vehicle Electronics & GPS\Car Audio\Car Audio In-Dash Units". The seller is "eandbelectronicsusa" and is located in Carlstadt, New Jersey. This item can be shipped to United States, Canada, United Kingdom, Denmark, Romania, Slovakia, Bulgaria, Czech republic, Finland, Hungary, Latvia, Lithuania, Malta, Estonia, Australia, Greece, Portugal, Cyprus, Slovenia, Japan, Sweden, South Korea, Indonesia, Taiwan, South africa, Thailand, Belgium, France, Hong Kong, Ireland, Netherlands, Poland, Spain, Italy, Germany, Austria, Russian federation, Israel, Mexico, New Zealand, Philippines, Singapore, Switzerland, Norway, Saudi arabia, United arab emirates, Qatar, Kuwait, Bahrain, Croatia, Malaysia, Brazil, Chile, Colombia, Costa rica, Panama, Trinidad and tobago, Guatemala, Honduras, Jamaica.